Many enzymatic processes involve a mechanism in which reaction intermediates are covalently attached to the enzyme’s active site. A strategy has been devised that enables mimics of these intermediates to be visualized. Andrew M. Gulick is in the Department of Structural Biology, Jacobs School of Medicine and Biomedical Sciences, University at Buffalo, Buffalo, New York 14203, USA. Enzyme structure and function are routinely studied by altering the DNA that encodes the enzyme, thus replacing specific amino-acid residues in the enzyme with other residues. Unfortunately, the substitute residues are generally limited to those derived from amino acids that exist in nature (canonical amino acids). One strategy for overcoming this constraint is to use genetic-code expansion to engineer the cell’s protein-synthesis machinery. In this approach, enzymes called amino acyl-tRNA synthetases are designed to load non-canonical amino acids (ncAAs) onto transfer RNAs, so that the ncAAs can be incorporated into proteins by the cell’s ribosome apparatus1. Writing in Nature, Huguenin-Dezot et al.2 report a method for studying enzyme mechanisms that uses genetic-code expansion in a new way. The authors demonstrate the utility of this approach using an enzyme that produces an antibiotic. Many enzymes form covalent chemical bonds to the reacting molecule as part of their strategy for catalysing reactions. In one common class of enzyme, this process generates acyl-enzyme intermediates in which a covalent bond has connected a nucleophilic group (most commonly a serine or cysteine amino-acid residue) in the enzyme’s active site to a carboxylic acid group (COOH) in the reactant; this produces either an ester or a thioester linkage from a serine or cysteine residue, respectively (Fig. 1a). In a second step, the covalent bond is broken through a hydrolysis reaction, releasing the product of the enzymatic reaction and restoring the reactive nucleophile for a second round of catalysis. Figure 1 | Stabilizing reaction intermediates of enzyme reactions. Enzymes known as non-ribosomal peptide synthetases assemble peptides or depsipeptides (peptides that contain one or more ester linkages). These enzymes use carrier domains to shuttle the growing product to catalytic domains for modification and extension. a, The bound product is released from the final carrier domain through a reaction catalysed by the thioesterase domain. A nucleophilic amino-acid residue (often, a serine residue, the side chain of which is shown here) in the thioesterase domain reacts with the linkage that attaches the depsipeptide to the carrier domain. This produces an acyl-enzyme intermediate, which is subsequently hydrolysed to release the depsipeptide. b, Huguenin-Dezot et al.2 report a method in which the nucleophilic residue is substituted by the 2,3-diaminopropionic acid (DAP) residue — which here replaces the hydroxyl (OH) group of serine with an amine (NH2) group. The resulting acyl-enzyme intermediate resists hydrolysis, allowing it to be visualized using X-ray crystallography. Visualization of the acyl-enzyme intermediates by X-ray crystallography is often challenging because spontaneous hydrolysis can occur. Huguenin-Dezot and colleagues have developed a system that allows the nucleophilic amino-acid residue to be replaced with an ncAA residue called 2,3-diaminopropionic acid (DAP). In effect, this switches the hydroxyl group (OH) of serine — or the thiol group (SH) of cysteine — for an amine group (NH2). The acyl-enzyme intermediate that forms from the DAP residue is resistant to hydrolysis, and is therefore suitable for structural characterization (Fig. 1b). 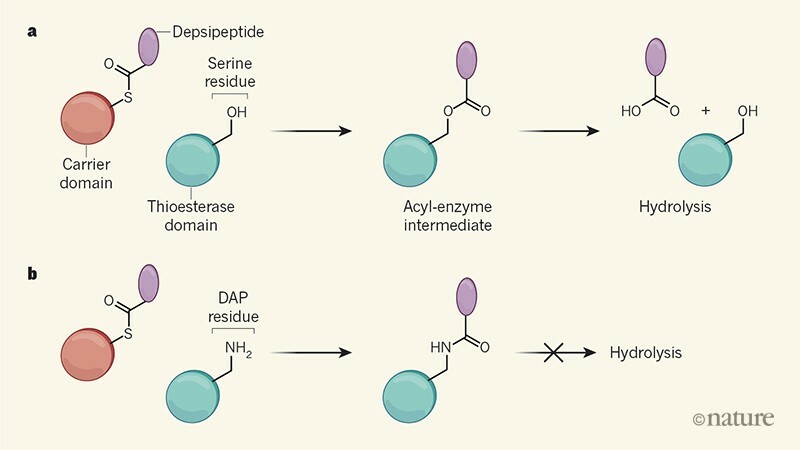 The chemical similarities between DAP, serine and cysteine amino-acid residues made it difficult for the authors to engineer an amino acyl-tRNA synthetase that selectively loads only the ncAA. They therefore attached a ‘masking’ group to the side chain of DAP so that the modified ncAA could be distinguished from the canonical amino acids. Once the modified DAP has been incorporated into an enzyme, the masking group is removed by exposing the protein to ultraviolet light. Huguenin-Dezot et al. tested five DAP analogues that had different masking groups, and found one that accumulates in protein-producing bacteria at sufficient concentrations to enable its incorporation into proteins. The researchers then engineered an amino acyl-tRNA synthetase to function with this modified DAP, and demonstrated that the DAP analogue could be incorporated, and subsequently unmasked, in a test protein (green fluorescent protein). As a second test case, they incorporated DAP into the active site of a cysteine protease enzyme, and showed that the inserted DAP indeed forms an acyl-enzyme intermediate that is resistant to hydrolysis. The authors went on to use DAP to study the antibiotic-producing enzyme valinomycin synthase. This enzyme belongs to a family of proteins known as non-ribosomal peptide synthetases (NRPSs), which construct peptides or depsipeptides (peptides that contain one or more ester linkages). NRPSs have a fascinating ‘assembly-line’ architecture: the growing peptide is attached to carrier domains that shuttle the intermediates to neighbouring catalytic domains, where the peptide is modified and extended3. This biosynthetic strategy requires that the bound product is ultimately released from the final carrier domain, freeing up that domain to conduct additional synthetic cycles. The release occurs through a reaction carried out by the thioesterase domain. The thioesterase domain catalyses this reaction by forming a covalent bond to the peptide to generate an initial acyl-enzyme intermediate, which then either is hydrolysed or undergoes a macrocyclization reaction to release the peptide; macrocyclization reactions are those in which the ends of a long peptide chain join together to form a large, ring-shaped molecule. Valinomycin consists of three copies of a short depsipeptide (a tetradepsipeptide), which are joined together by the thioesterase domain of valinomycin synthase to form a ring4. Using the wild-type enzyme, Huguenin-Dezot and colleagues first demonstrated that the thioesterase uses a ‘retrograde’ reaction mechanism to join the three tetradepsipeptides together. After the first tetradepsipeptide has been loaded onto the nucleophilic residue in the thioesterase domain, the second tetradepsipeptide arrives at the thioesterase active site, attached to the carrier domain. The first tetradepsipeptide is then transferred to, and reacts with, the second one, temporarily placing the resulting octadepsipeptide product on the carrier domain (rather than the second tetradepsipeptide being transferred to the first one on the thioesterase domain). The octadepsipeptide then migrates to the thioesterase domain, and the third tetradepsipeptide is brought to the active site to repeat the reaction cycle. This generates a dodecadepsipeptide that finally undergoes macrocyclization to form valinomycin. The authors next incorporated DAP into the thioesterase domain to produce a stable acyl-enzyme intermediate that could be visualized using X-ray crystallography. The full structure of the dodecadepsipeptide could not be clearly visualized, but the residues that could be seen suggest that the active site of the thioesterase guides macrocyclization, partly by excluding water to minimize hydrolysis, and partly by directing the peptide’s terminals towards each other for the reaction. The X-ray structure also shows that part of the thioesterase domain known as the lid region undergoes a substantial conformational change to orient the depsipeptide correctly for reaction. When the serine or cysteine residue of an enzyme is replaced by DAP, the corresponding ester or thioester linkage in the acyl-enzyme intermediate is replaced by an amide linkage. It should be noted that this is not a perfect mimic of the natural linkage. The very feature of the amide that makes it resistant to hydrolysis — the fact that it behaves in part like a double bond — also constrains it to a planar geometry. Such a restriction does not apply for ester and thioester linkages. This is a minor issue, however, and does not diminish the value of visualizing the amide analogue of the natural acyl-enzyme intermediate. Huguenin-Dezot and co-workers’ method could be used to study various enzymatic systems, including enzymes of the ubiquitination pathway5 (which marks proteins for degradation), or any of the many types of hydrolase enzyme used in diverse bond-cleaving processes6,7. Previous efforts to visualize the structures of acyl-enzyme intermediates have often used molecules that react irreversibly with the nucleophilic amino-acid residues in active sites8, to produce stable analogues of acyl-enzyme intermediates — but these might not mimic the ester (or thioester) linkage as closely as do Huguenin-Dezot and colleagues’ amide analogues. Furthermore, the new work could complement the use of ncAAs that bear reactive groups, which can be incorporated into large, multidomain enzymes to form covalent cross-links between proteins or protein domains to trap functional states for structural studies. This has previously been done for polyketide synthase enzymes (which are closely related to NRPSs) at non-catalytic residues positioned at domain interfaces9. Huguenin-Dezot and co-workers’ introduction of ncAA residues at positions that are responsible both for chemistry and for recognizing enzyme substrates or partner proteins, perhaps used in combination with chemical analogues of substrates and intermediates8, might uncover previously unknown structural features of biosynthetic enzymes. Finally, DAP residues could potentially be used in a complementary method to existing approaches for profiling enzyme function10: they could trap molecules from pools of metabolites in the active sites of uncharacterized hydrolases, and the bound molecule could be then identified using methods based on mass spectrometry to define the enzyme’s preferred substrate. With such a wide variety of applications, Huguenin-Dezot and colleagues’ method is a valuable addition to the protein chemist’s toolbox that will advance the study of many important enzymes. Wang. L., Brock, A., Herberich, B. & Schultz, P. G. Science 292, 498–500 (2001). Huguenin-Dezot, N. et al. Nature 565, 112–117 (2019). Payne, J. A., Schoppet, M., Hansen, M. H. & Cryle, M. J. Mol. Biosyst. 13, 9–22 (2016). Cheng, Y. Q. ChemBioChem. 7, 471–477 (2006). Olsen, S. K., Capili, A. D., Lu, X., Tan, D. S. & Lima, C. D. Nature 463, 906–912 (2010). Bachovchin, D. A. & Cravatt, B. F. Nature Rev. Drug Discov. 11, 52–68 (2012). Lentz, C. S. et al. Nature Chem. Biol. 14, 609–617 (2018). Gulick, A. M. & Aldrich C. C. Nat. Prod. Rep. 35, 1156–1184 (2018). Ye, Z. & Williams, G. J. Biochemistry 53, 7494–7502 (2014). Backus K. M. et al. Nature 534, 570–574 (2016).